Havells India Limited a major power distribution equipment manufacturer with a strong global footprint. Havells enjoys enviable market dominance across a wide spectrum of products, including Industrial & Domestic Circuit Protection Devices, Cables & Wires, Motors, Fans, Modular Switches, Home Appliances, Power Capacitors, CFL Lamps, Luminaires for Domestic, Commercial and industrial Applications added in its Range Electrical Water Heaters Imported and Marketed in the name of Havells from china, the company now manufactures 2 models in their own units Called the PURO / MONZA SLEEK these water heaters takes approximately 60 minutes to heat water upto 55degrees. Orient Electric Known for their Ceiling Fans are now in the water heater market with over 3 models the company has outsourced their water heater manufacturing in the name of orient electric, these water heaters are fitted with a PUF insulation, Mildsteel Inner Container inner container and Copper Heating Coil which takes approximately 45 minutes to heat water upto 55 degrees which is why it gets a 5 star rating by BEE for 25 litres water heater. 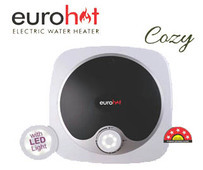 Venus Home Appliances Pvt ltd An (ISO - 9001 company) (formerly Standard Electric Appliances) the manufacturers of Venus Water Heaters is a 40 year old Company that has been a market leader and a pioneer in the water heater industry. this water heater is PUF Insulated fitted with a Mild Steel Titanium Enameled Tank and a Ceramic Coil which takes approximately 50 minutes to heat up to 55 degrees. A. O. Smith water heater manufacturer of water heaters, have started assembling their water heaters in india, these water heaters have are PUF Insulated fitted with a Glass Lined Mild Steel tank and incoloy heating element coated, which takes approximately 70 minutes to heat water upto 55 degrees, not an indian product so doesnt carry an ISI or BIS rating. Usha Shriram 45 years a leader in Gensets, ceiling fans and sewing machines, well this water heater is PUF Insulated fitted with a Mild steel inner container and a Incoloy Heating Element which takes approximately about 55 minutes to heat upto 55 degrees, Products imported and marketed in the name of USHA from China. Crompton Greaves Master in manufacturing of domestic fans and many other products well known everywhere, the company imports a few models of water heaters from china and outsources others from different companies the water heaters is PUF Insulated fitted with a Mild Steel inner container and a Incoloy which takes approximately about 52 minutes to heat upto 55 degrees so gets a 1 star rating by BIS for a 25 litres water heater. Bajaj Electricals New Models Platini / Shakhi / Majesty : all Products of China which is PUF Insulated fitted with a Glasslined Mild Steel inner container and a Incoloy heating Element this water heater geyser takes approximately 50 - 60 minutes to heat water upto 55 degrees this model gets no ISI or BIS as it is imported and marketed by bajaj. V-Guard Stabilizer manufacturing company ,Outsourcing its water heaters since 2007 from different suppliers, These water heaters carry a Mildsteel tank and a Incoloy Heating Element which takes approximately 60 min to heat water up to 55 degrees Most of the products are imported from China. Gilma Appliances pvt ltd. Chinese Outsourcing Company newly added water heater range , this water heaters is fitted with a Mild Steel enameled coated tank and incoloy heating element, this water heater takes approximately 70 minutes to heat water upto 55 degrees. Kenstar 1st created history in appliances and then diversified to different sectors in electrical and electronic goods, kenstar has its water heaters in the market since 2008 kenstars water heaters carry a Mild steel tank and a copper coil which takes approximately 60 min to heat water upto 55 degrees this model carries an isi rating of 1 star and bee rating of 5 star as it is well insulated but is not manufactured by kenstar it is only marketed in the name of kenstar. EXPECTED LIFE OF PRODUCTS DEPEND ON HARDNESS OF WATER AND OTHER FACTORS.